Total this morning: 7 inches. I love the snow, but I hate being surprised by shoveling. 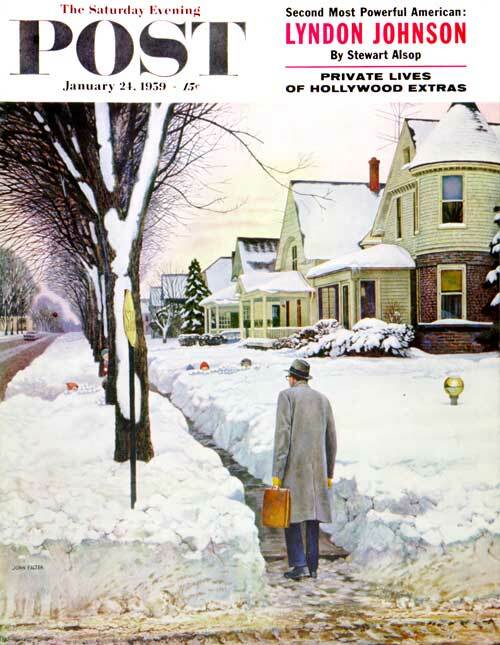 By the way, the cover on the left is “Snowy Ambush,” by John Falter. Can you tell me why it has that title? Let me know in the comments. I stared at the pic for 20 minutes before I figured it out. Is it weird that when I hear the name Glenn Frey, I think of his solo stuff/Miami Vice before The Eagles? Of course I think of The Eagles too, the brain synapses clicking everything into focus rather quickly, but before The Eagles I actually think of “Smuggler’s Blues” and “You Belong To The City” and his appearance on Miami Vice. You can tell I was formed by the 80s in many ways. I can’t say I was the biggest fan of the band. Sure, I remember many nights listening to “Hotel California” and “Witchy Woman” while a certain type of smoke billowed all around us and really loving it – if you’re of a certain age The Eagles greatest hits were a big part of your life – but they’re not a band I still listen to. You move on from certain bands, even if a song here and there gets you thinking about things again. My favorite Eagles song – by far – isn’t even sung by Frey or Don Henley. It’s sung by Timothy B. Schmit. That’s a beautiful song, and they’re flawless musicians. It snowed the other day. Not a big storm but enough to say you shoveled and had to put down rock salt. More coming this weekend and it’s supposed to be major. I’ll try to get The Letter out by then! It’s flu season, and I’ve decided to participate. I’ve felt worse, but I can’t remember when. I don’t even know if it’s technically “flu” or just “I’m really sick.” We never called it “the flu” when I was a kid, even if it was, we just said we were sick. I’m tired, my nose and sinuses feel like they’re filled with wet paper towels (and they’re on fire), I’m sneezing like crazy, I have head and body aches, and my throat is dry. Flu? Bad cold? You make the call! Since flu is a “season,” almost a holiday, there should really be some songs and carols that mark the season. New column up. If you need me I’ll be on the couch with a cup of tea, a comforter, a book, and a box Coricidin. Have a great weekend.